The following is a very simple example of event stream processing (using the ESPER engine). What is Complex Event processing (CEP)? Complex Event Processing (CEP), or Event Stream Stream Processing (ESP) are technologies commonly used in Event-Driven systems. These type of systems consume, and react to a stream of event data in real time. Typically these will be things like financial trading, fraud identification and process monitoring systems – where you need to identify, make sense of, and react quickly to emerging patterns in a stream of data events. A CEP system is like your typical database model turned upside down. Whereas a typical database stores data, and runs queries against the data, a CEP data stores queries, and runs data through the queries. 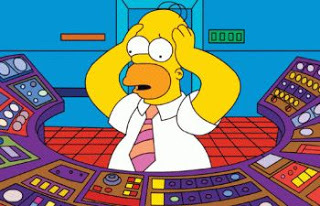 Take the example of a Nuclear Power Station..
Now I don’t know what the core is, or if it even exists in reality – but for this example lets assume our power station has one, and if it gets too hot – well, very bad things happen.. Lets also assume that we have temperature gauges (thermometers?) in place which take a reading of the core temperature every second – and send the data to a central monitoring system. ALERT us if we have 4 consecutive events, with the first one above a certain threshold, and each subsequent one greater than the last – and the last one being 1.5 times greater than the first. 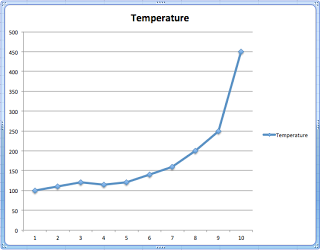 This is trying to alert us that we have a sudden, rising escalating temperature spike – a bit like the diagram below. And let’s assume this is a very bad thing. Using Esper – we can create 3 queries (using EPL – Esper Query Language) to model each of these event patterns. We can then just throw Temperature data through the service – and let Esper tell alert the listeners when we get matches. At the core of the system are the 3 queries for detecting the events. 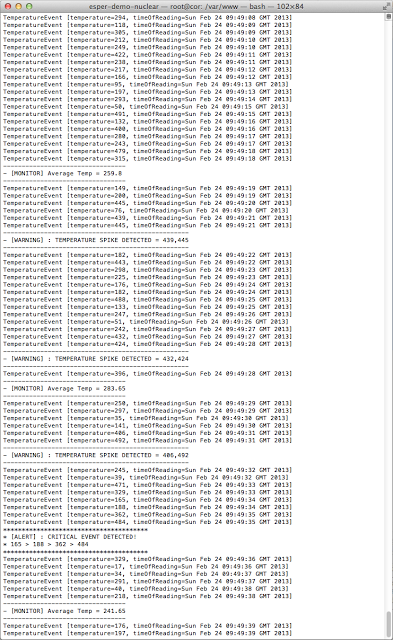 select * from TemperatureEvent "
* Immutable Temperature Event class. * The process control system creates these events. * @param value Temperature in Celsius. * Get time Temperature reading was taken. In our main handler class – TemperatureEventHandler.java, we initialise the Esper service. We register the package containing our TemperatureEvent so the EPL can use it. * Auto initialise our service after Spring bean wiring is complete. // Recognise domain objects in this package in Esper. * where the last event is 1.5x greater than the first. And finally – an example of the listener for the Critical event. This just logs some debug – that’s as far as this demo goes. * Wraps Esper Statement and Listener. No dependency on Esper libraries. * than the first - issue a critical alert. // Example using 'Match Recognise' syntax. String criticalEventExpression = "select * from TemperatureEvent "
+ "measures A as temp1, B as temp2, C as temp3, D as temp4 "
+ "pattern (A B C D) "
+ "       A as A.temperature > " + CRITICAL_EVENT_THRESHOLD + ", "
+ "       B as (A.temperature < B.temperature), "
+ "       C as (B.temperature < C.temperature), "
+ "       D as (C.temperature < D.temperature) "
+ "and D.temperature > "
* Listener method called when Esper has detected a pattern match. An example of the running demo is shown below – it generates random Temperature events and sends them through the Esper processor (in the real world this would come in via a JMS queue, http endpoint or socket listener). When any of our 3 queries detect a match – debug is dumped to the console. In a real world solution each of these 3 listeners would handle the events differently – maybe by sending messages to alert queues/endpoints for other parts of the system to pick up the processing. Using a system like Esper is a neat way to monitor and spot patterns in data in real time with minimal code. This is obviously (and intentionally) a very bare bones demo, barely touching the surface of the capabilities available. 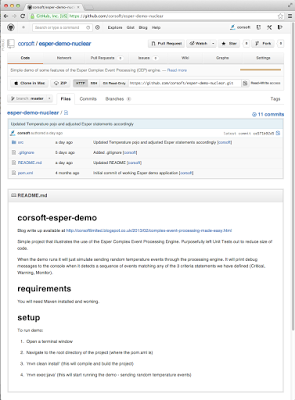 Check out the Esper web site for more info and demos.